One of the most frequently visited pages on your author website will be your “About Me” page—and, luckily, that page doesn’t have to feature a standard author bio in a basic, humdrum presentation. At Web Design Relief, we know there are fun, new ways to design your “About Me” page so that readers and fans can discover more about you as a writer and as a person. Do you ski? Collect antiques? Wear Hawaiian shirts? Have a few great writing awards on your bookshelf? Use engaging widgets and eye-catching elements on your “About Me” page to let your readers know! Showing off your social media posts is one of the most effective ways readers can learn more about you. Your Twitter feed, Facebook timeline, Instagram posts, and other social media will connect web visitors to your latest thoughts, activities, publication credits, events, updates, and more in real time. Use widgets and plugins to offer live integration to your social media. Instead of using only words to tell the story of who you are and what you do—add images! Just because website design is trending toward minimalism doesn’t mean you can’t have multiple photos on your “About Me” page. Use photo-based widgets like sliders, galleries, and photo stacks to express your interests and personality. Many of these widgets also offer the option to caption each photo, which you can use to add some biographical info to the page while maintaining a clean design. Audio posts are an easy and creative way for your audience to hear your message in your own voice. Grab your phone or laptop and record your voice—you can give your visitors a unique welcome to your author website and thank them for stopping by. Then upload the recording to your “About Me” page. Podcasts have become one of the most popular forms of storytelling on the Internet, so you might want to consider starting your own! Just remember: If you read any of your work on a podcast, it could be considered previously published. Learn more here. Of course, we mean create an infographic about you for your author website! Timelines are a visually intriguing and concise way to tell visitors the highlights of your life. Use a timeline to give potential fans and followers a map of your educational, professional, and publishing history. Make it fun and include some not-so-pertinent-to-writing but intriguing facts: If you write horror, perhaps include the day you saw your first vampire movie. If your genre is cookbooks, maybe note the day you discovered 101 uses for chocolate chips. Set up your timeline the way you would create an outline for a story—but this story is all about you! Posting a video or videos to your “About Me” page can help you create a more personal connection with your website visitors than is possible with just a written bio. You can film a welcome video or “listicle” video to tell viewers a little bit about yourself. You can even film weekly vlogs to keep your fans up to date on your writing, book-signing events, readings, or other ventures. Not sure how to start? Quickly learn the ins and outs of vlogging. 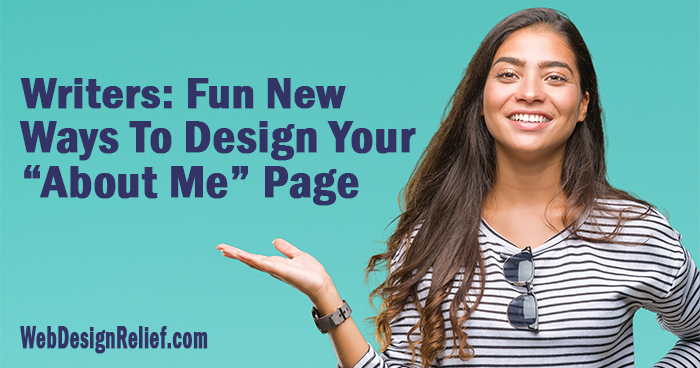 It’s time to bring your “About Me” page into the 21st century! This frequently visited page on your author website is the perfect place to showcase different mediums like audio, visual, or video posts. You’ll engage your visitors in a way that a few written paragraphs could never accomplish. And if you need help creating or updating your author website, schedule a free consultation with Web Design Relief today! QUESTION: Which one of these “About Me” page ideas are you most likely to try?